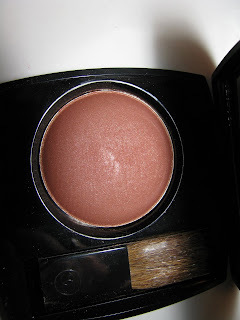 The next best thing to a sunny getaway, DivaDebbi LOVES Sircuit Soleil Bronzer. Clumps of Mascara shows that glittery eye shadow CAN be worn to work. Maybe. BeautySweetSpot’s Confessions of A Speed Dater from PurpleLabNYC’s Find A Luvah Event. Butterflydiary is loving the relaunch of Noxzema and dishes why. The Product Pasha cannot get enough of MAC's Spring Forecast 2 Malibu Peach Nail Lacquer. Adina of Krasey Beauty introduces you to the most amazing lipstick ever: Thierry Mugler's Rouge Unique in Fantasy. To say that Chanel couture this season was stunning would be a gross understatement. I want to hang pictures of it on my wall to gaze at. Called Neon Baroque the collection features all pastels and silver. Lace, Lesage embroidery, silver boots with pearl trim , chrome nails and lips done in the new , soon to released Rouge Allure Luminous Satin Lipcolor. It's all there. I loved it down to the sparkling stockings. 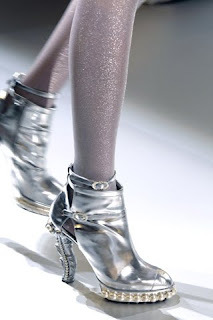 Each season Chanel does the most amazing stockings it seems. The lipcolor shade is Genial and the nails are Le Vernis Nail Colour in Silver . Silver is a why, oh why, is it not available in the US shade ? Look how sleek it is on the nails. We need this here. “Hidden” seams. It takes 3 hours to hand-stitch these seams along one meter of fabric. To make the “hidden seams” of some pieces took 35 hours of work in the atelier." "Silver threads or silver paint on embroidered satin" , " Silver stucco effect for the baroque touch"
In March American Beauty, the Estee Lauder brand exclusive to Kohls will bring out a new flanker to the American Beauty line called American Beauty Beloved Purple Blossom. When I read the note list I wanted to try it. I have not, though , ever smelled any of the previous scents. I was attracted to the Lilac note especially. It's not too common to see a lilac note. The lilac isn't overly pronounced here but does show up some. A half hour into the drydown is when the lilac begins to pop most. More predominant are the honeysuckle and peony to my nose. Other notes include: jasmine sambac, gardenia, and mimosa. The scent comes out a little watery floral than full floral but also with plenty of spring flowers. The flowers come out more as it dries down. It's light but noticeable and simply pretty. 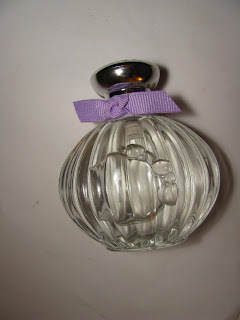 The bottle is very old fashioned boudoir looking, and is the same as the previous bottles only with a lilac ribbon and cap topper. It reminds me of Penhaligons of England bottles in a way and I love vintage style of it. This necklace from Joomi Lim is a perfect melding of chic pearls and rock and roll spikes. 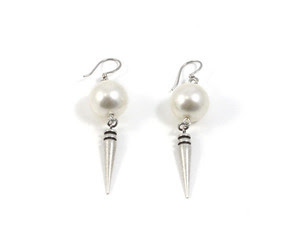 These are not your grandma's pearls. I love pearls and mixing them up like this, even more. The basic strand is usually not my thing. There are also matching earrings and both are handmade in NYC. The name almost sounds ominous but The Eraser aims to help you turn back the clock a bit. This is not simply makeup but a treatment containing Goji Berry and Collagen. Maybelline states that years of research have gone into this product and it holds many patented innovations. 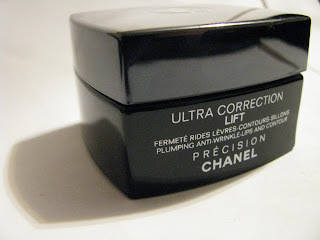 The foundation goes on with a "micro-corrector " applicator. Now I bet we all think the same thing- will it work ? Well yes it does. I did still need to use my fingers a little, but overall the sponge did it's job. It blended really well and evenly. This makes it easy to use quickly or on the go. The Mom tried it as well. She obviously has more mature skin and is pretty devoted to a couple high end foundations. She loves it. It looks great on her skin and she feels it compares very well to those higher end ones. The foundation leaves skin looking very smooth, with a lightly illuminated look although there is no shimmer here. More like a hint of a soft focus . 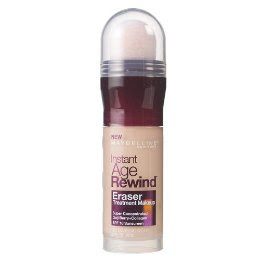 It has medium coverage , not heavy or full, feels good on skin and is very moisturizing. 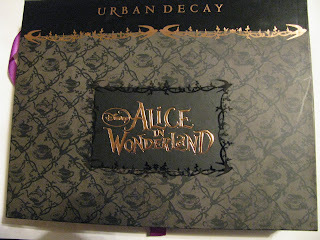 Hottest item so far this year- the Alice in Wonderland Book of Shadows . It's a good one, so lets take a close up look. So far all I have seen is the main image. I tried to get some shots of the artwork inside and how unique it is. 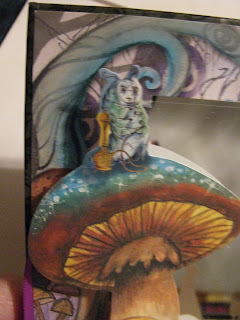 It's a pop up book for makeup nuts. The shadow collection is nice too. All former shades, renamed in Alice speak. It's online right now at Sephora until it sells out. All the new issues of the fashion mags have been running the new DKNY Spring ads. Every time I see it, I am all over the handbags shown. I decided to track down more info and in doing so, saw even more amazing styles. DKNY has jumped on the chain strap bandwagon. I can't tell you how excited I am that chain straps are back. Me, I never stopped using them , they just got harder to find. Fashion has re-caught up with me at last. Here are some of my favorite styles, with my very favorite being the white gathered one with chain strap. It's so me , I cannot tell you. Some of these are really tough, and then there is the simply classic and always in style mock croc. You want to make my day, talk to me about a new lip balm. I am nuts for these things. 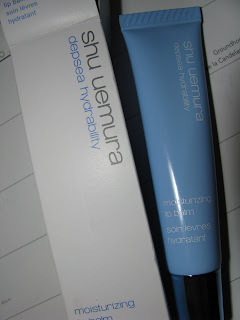 So you can imagine my excitement when my inbox showed a new one from shu uemura. HOLA. One with depsea water one , no less. I was all a flutter. Silly, yes but what can I tell you. Thats why I write this blog. This balm glides over your lips. It's got a little shine but no color or flavor. The moisture is intense . Lasts long too. A not so basic , basic. With this your lips will never be dry. Other key ingredients in the depsea moisturizing lip balm include beeswax and macadamia nut oil . Reality show Shear Genius is set to begin it's new season on February 3rd. An exciting addition- hugely famous styling guru Orlando Pita will be join the show. Every Wednesday, beginning February 3rd, contestants will lather, rinse and compete in the “Shear Genius” Nexxus Salon. Fans of the show can enjoy the competition online by signing up with Nexxus on Facebook (click here – http://www.facebook.com/nexxus) to receive tips for recreating the winning looks at home, “blow” by “blow” commentary from Nexxus Creative Director and celebrity guest judge Kevin Mancuso, and much more!" 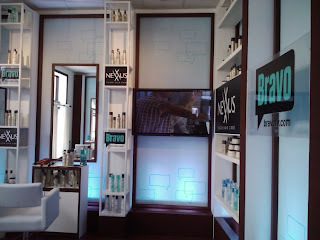 *Photo is the Nexxus and Shear Genius booth at Sundance this week, and a Bravo exec doing a Locks of Love donation. 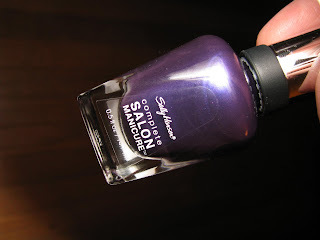 Sally Hansen has another new nail polish for us to try. Their Complete Salon Manicure. In one bottle you get base coat, strengthener,growth treatment, top coat and oh yes , color . 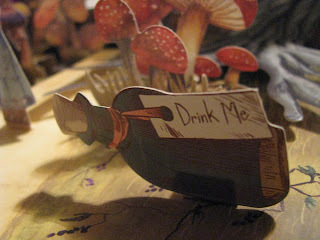 I love the idea that I can have one bottle and get it done. Who wouldn't? 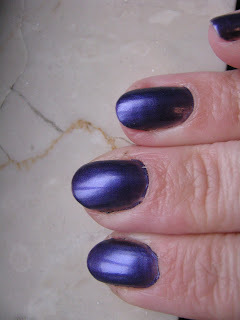 I tried the shade Purple Pulse , which is a hot , bright purple that has a bit of blue in it. I needed 2 coats to get full color. The first went on sheer , the second became the bottle shade. It's shiny( although I could have it shinier. I can not have enough shine on my nails) and looks great. It dried fast, and nails looked smooth. The brush is the same as the Insta Dri one. Wider than normal and not a favorite of everyone. It works fine for me. I did get tip wear fast. which isn't unusual for me as I am hard on my nails, but I would have liked it to go a little longer than that. I think ultimately that I will still add an additonal top coat over it. With that , it will be great. The Complete Manicure line is 52 shades, so there is something for everyone. From pale pink to green. with the shade Commander in Chic, a khaki-greige , getting a lot of notice. Other shade shown here: Raisin the Bar. Retail is $ 7.00 but sales and discounts are prevalent. 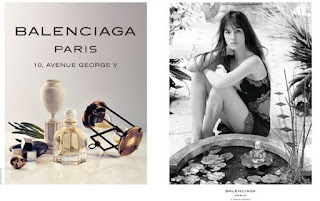 One of the most anticpated fragrance releases this year is Balenciaga Paris. It seems like it took forever to finally arrive. Billed as a violet chypre it's mostly violet. Not a sweet violet, it has many green stem notes and no powder. This is good but it lacks enough chypre. It's rare to find a good chypre though, and that anyone is attempting to market a semi one is something in itself. The thing is this should have been edgy. The current Vogue( Feb.) has an article quoting Nicolas Ghesquiere and Charlotte Gainsbourg saying how they wanted edgy, or in his words, weird, and how she herself picked the stronger of the two. In reality it should be even stronger, with a touch of leather maybe, or the furniture wax smell that Ghesquiere stated he loves, as well as more oakmoss . Now I love violet. A lot. So this does appeal to me, I just lament what could have been . It is very pretty , not the same as every other scent out there . Besides the violet and green notes there is a slight metallic edge and some of the moss of a chypre. Other notes include cedar and distilled woods. It's a good mix . Sillage and lasting power are very good. Balenciaga Paris will be in stores here beginning next month . One of my favorite brands, Elemis, has launched a new, limited-edition skincare set for the month of January only to detoxify and moisturize tired and dry skin . Called Elemis Rose & Lavender Recovery Regime , the set comes in a metallic purple make-up bag. The regime features a collection of day and night skin boosters to restore and revive the complexion for pure skin bliss. This anti-aging regime is all stressed skin needs for a complete recovery. 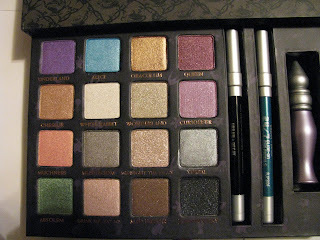 · Beautiful, metallic Purple Make-up Bag. 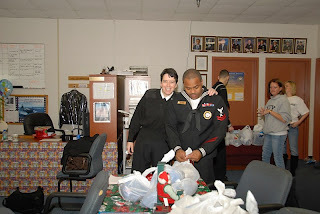 Before Christmas , I was happy to be a small part of helping female veterans in the Norfolk,VA area have a happier holiday. My dearest friend The Movie Mommy is a Navy Reserve recruiter and asked me about getting some nice personal items for the ladies. Things like body lotion, shower gel, lip balm. Very basic but not so much to them as all they have is hospital issue . She wanted items that were a bit nicer. One thing I don't think we think about ( I know I didn't) is that many vets are young women. In the hospital she was collection for, there were younger and older women. 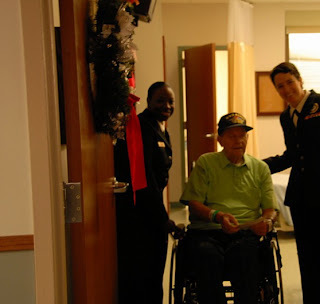 In the first picture the young woman not in uniform is a vet at the hosptial. 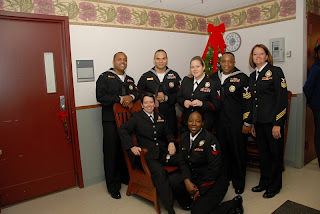 My friend's recruiting area basically adopted this hospital and it's vets for the holidays. As she said, for many it was the only gifts they might get. ( They gifted the men as well). Many of the people who helped me to coordinate my end wish to remain anonymous, in the spirit of the holiday, they said, so I can't thank them by name. They know who they are though and so I do thank them hugely. One never expects generosity , and when it comes it's a beautiful thing. I chose to not remain anonymous and post on this to help spread the word and perhaps inspire others, not for any self promotion. Here are some photos of the day and what a little beauty and a helping hand can do. 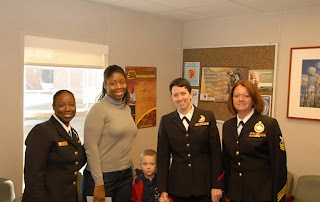 Chief credit for this endeavor goes to the Navy's Sally Patton and Pamela Copeland who did the bulk of the legwork, pictured in the group photo. 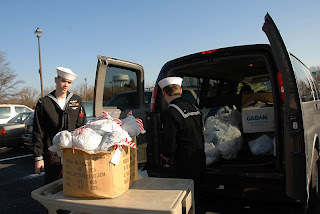 Bravo Zulu ladies. This hand/nail cream is one of those tiny, random samples that I've had and have no idea where I got it. At least I finally decided to try it, because it's darned good. The Multivitamin Hand and Nail Treat does more than just moisturize my hands, it makes my nails look shiny and healthy. I suffer from drier nails in the cold as well as dry , cracked areas around the nail bed. Seeing this in the cupboard was a good find. The tube says to use just once per day , and a visit to Dermstore.com gave me some of the ingredients: " Pro-vitamin B5 and algae extract soothe irritation and protect against environmental damage while licorice extract and vitamin C even the skin's tone. Vitamin A aims to diminish visible signs of aging as ginkgo biloba, grape seed and vitamin E shield with antioxidants"
I love that it's made my nails healthier. It's also not greasy or heavy and dries fast. Two thumbnails up. I stumbled across tweets by Livia Firth via British Vogue the other day. It turns out she is blogging for the magazine throughout her awards show appearances with her husband. Yes, that husband is Colin Firth. Livia is very into all things eco- friendly and sustainability. To that end she has taken the challenge to do all the red carpets in not only eco- friendly beauty products but re-purposed dresses as well. In this adorable photo, you can see the couture wedding dress she turned into her Golden Globes dress. She won't get much press here, but the blog will follow her and all her looks with many pictures( including Colin) if you are interested. So far I find it really fun. Creed fragrances have begun a proceeds donation beginning today for the people of Haiti. Creed is not inexpensive, so that means that 5% can amount to a decent donation. If you were thinking of making an online purchase, perhaps now is the time. "CREED announces it will donate five percent of proceeds from sales at http://www.creedboutique.com/, the official, exclusive online boutique of CREED, to Haitian earthquake relief efforts, starting today. CREED has selected ADRA (http://www.adra.org/) as the vehicle for its financial support to Haiti. ADRA is highly recommended by experts working in the quake zone in Haiti. Among ADRA's initiatives in Haiti are medical services and water purification, making undrinkable water drinkable. In good times, CREED is a trading partner of Haiti, purchasing Haitian vetiver grass, the essence of which is extracted in CREED's workshop in France for our beloved Original Vetiver fragrance. CREED is proud to stand by Haiti now." The past few weeks brought deeply cold winter winds to most of the country, even Florida had snow. These are the temps that test our skin. A good lotion is needed. 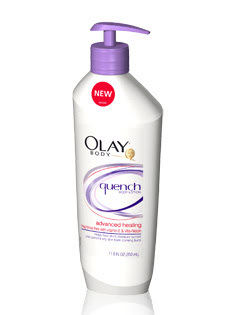 Olay Body Quench Advanced Healing Body Lotion is the newest, ultra- hydrating lotion from Olay. This one is said to bring 24 hr. 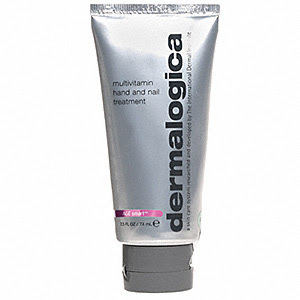 moisture and to help heal skin's moisture barrier over time. Now 24 hours is a lot to ask, but the better ones will last long. This lotion does last and moisturizes long. It's very thick but doesn't go on greasy or heavy. It sinks in fast but works. The lotion is fragrance free and has Vitamin E and Vita Niacin. By the way, Olay has a test you can use on both skin and hair for dryness "Put a water droplet on skin or hair. If the droplet stays intact, it is a signal that your skin or hair is moisturized. If the droplet soaks up, it’s a sign that you need protection and nourishment "
When I saw the new Chanel Spring line on counter a couple weeks back , the new blush jumped out at me immediately. 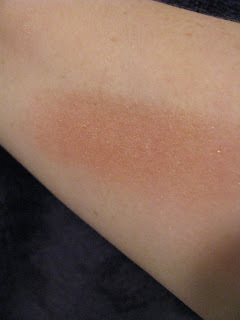 Yes there is that pretty interlocking C shimmer powder, but that didn't grab me. I have more shimmer powders than I can use. Blush, well I have plenty, but I can always use more. Imprevu is new and will become part of the permanent line. It is a gorgeous copper shade. Perfect for me, and really will work on many skin tones. It looks far deeper in the pan than it goes on. 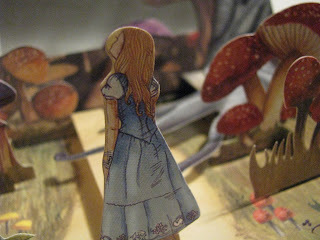 You get more of a sheer/medium wash of color than you'd think at first and can build from there. It has a lot of shimmer and just brightens you right up. It's a very warm weather shade but works well now too. On counters now and part of the Les Impressions de Chanel . Krasey Beauty is turning one, and you are invited to enter a beauty giveaway worth $1k! Clumps of Mascara blogs about the awesome sales at CVS drugstores. BeautySweetSpot showcases the hottest new Spring makeup launches. The Product Pasha is swooning over Orly's Sweet Spring collection! Butterflydiary shows you how to get Emily Blunt's hairdo at the Golden Globes! 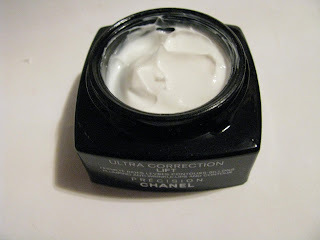 The Beauty Alchemist previews Chanel Ultra Correction Lift for Eyes and Lips. 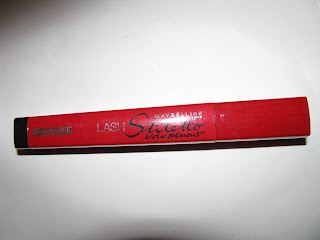 Lash Stilletto Voluptuous is the new addition to the Lash Stilletto line. I never tried the original, so I can't say how this compares to the first one. 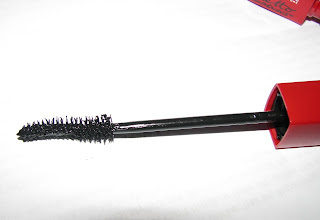 I heard it was very black and very wet, two things I am not that fond of in a mascara. I also prefer volume with length, so voila , now Maybelline has combined the two. Lash Stilletto Voluptuous is still a wetter formula, but not bad. It is also very dark but that also means it really shows up. It did give a lot of length and good volume. It is somewhat buildable. I did 2 coats no problem, the 3rd started to see some clumping. The brush is a slightly curved S shape. I should also mention I had the waterproof version. I've mentioned many times that I am the smudge queen, so a non- waterproof wasn't going to do it. Sadly, even the waterproof smudged a little. That did not thrill me. Overall if it wasn't for that , I would have really liked this. Take it with a grain of salt though, as I said, I can make a mess out of many mascaras. It did hold up really well otherwise. By the end of the day, I still had very dark, curled looking( without being pre- curled) lashes. January Jones looked stunning at the Golden Globes and her striking red lip was what made the look. It was done with a new Chanel lipstick debuting in March ( I can't wait to see these). Kudos to her for being a bit daring with the wide headband. It would have been easy to just do a normal updo. Now if they had just slid it back a wee bit more. I'm not crazy about the dress but her face glows and steals the show so that ultimately her dress doesn't matter that much. Her makeup artist was Rachel Goodwin . "I used Le Blanc de CHANEL under her base to create luminous 'glowing fromthe inside' porcelain skin, then treated her lips with CHANEL Hydramax +Active Lip Treatment before applying CHANEL Rouge Coco Lip Colour in Paris- a gorgeous garnet red from a new lipstick line launching in March. "I painted the finest black line on her upper lid with CHANEL Automatic LiquidEyeliner in Noir and shaded under her eyes with CHANEL Intense Eye Pencilin Graphite in the outer corners. I finished her look by layering lots ofdifferent false eyelashes then added Exceptionnel de CHANEL Noir ObscurMascara over the top for an intense black lash line." - Shiseido is buying Bare Escentuals for 1.7 billion ( yes, billion). Leslie Blodgett will remain with the same executives now managing the company. - Halle Berry will launch a flanker to her scent of last March called Pure Orchid in February. -If you are in Europe, look for more freestanding MAC stores to be opening soon. - CVS prestige branch Beauty 360 now has e-commerce at http://www.beauty360.com/ . Extra Care points accrue from these purchases just like all others at CVS and carts are shared between both sites. 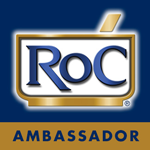 Brands include Vincent Longo , Borba , Laura Geller, Cargo. Many of us , myself included love Jil Sander's clothes ( although I miss Ms. Sander being at the helm) but as with many designers, we can have their fragrances if not their amazing clothes. 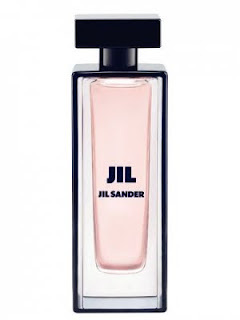 There is an extensive Jil Sander collection of perfumes, most quite nice. I own Style and Scent 79. Both of these are a bit different , not overly commercial , especially the leathery chypre of Scent 79 . Newest is Jil . Jil is a far more commercial perfume. It is pretty, but soft and light. There are light florals, some powder , a dash of the popular pink pepper note and then light woods. The juice is pink and it is a pink kind of scent, but not overly girly. It dries down less floral. Other notes include orris( iris), heliotrope, vanilla, musks and ambergris. Currently this is exclusive to Dillards stores. Creed fragrances has had a busy year, being prosperous in these times, and good for them. Recently they opened their first US boutique on Madison Ave. in NYC, in a corner location no less. I haven't been in yet, but sometime next month I hope to give it a look. I love to peruse their counters, but everything in one place will be even nicer. I have a short video of the boutique, which upon opening garnered praise from not just the mayor, but the governor of NY. Everyone loves to see economic progress. Creed is also now available everywhere thanks to the opening of an online store. Here you can find the home collection, soaps , lotions and bath gels as well as the full line of fragrances. 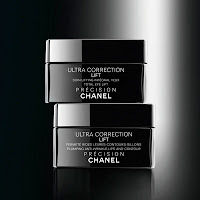 The Chanel Ultra Correction Lift line has been a favorite of mine and the company adds to it occasionally. Newest are Ultra Correction Lift Total Eye Lift and Ultra Correction Lift Plumping Anti-Wrinkle- Lips and Contour. The lip version has as well as the elemi PFA, Hilurlip a(micronized hyaluronic acid).Both are oil and fragrance free. The Total Eye Lift moisturizes nicely, but is not heavy or greasy. It works well under makeup. It smooths, gives a firming feel and feels wonderful on . I have only been using for 2 weeks, so longer testing will show how much actual lifting happens but so far it's working nicely. The Lift Plumping Anti-Wrinkle- Lips and Contour is an unusual product. I don't think I have ever tried a lip treatment before . This is a cream but when applied to the lips it dries down to a soft matte finish. It feels a little powdery on, but also adds a bit of moisture. It makes a nice base for lipstick/gloss .If you have lip area issues or want to prevent them ( if you are a smoker, you need this help especially) then this might be one to try. I can honestly say I am on the fence with it. I like but find the feel a bit odd. Maybe better in summer when my lips aren't chapped. I do intend to keep using it though, but maybe not every day. These will be on couners shortly and are pre order at the moment I believe.